Sprite was back at this year’s Superconference, and again he’s bringing out the big guns with awesome hardware hacks. This time, though, Sprite is tapping into his artistic side. Sprite is very accomplished in making PCB art and DaveCAD drawings, but actual art is something that’s been out of reach. No problem, because you can just buy an inkjet printer and make your own art. Sprite’s doing something different, and he’s turning his inkjet into a Magic Paintbrush. When the ESP-8266 first arrived, it was a marvel. For two dollars, you could buy a simple module that could serve as a bridge between WiFi networks and microcontroller projects. It understood the Hayes command set, it didn’t use much power, and, as noted before, it only cost two dollars. The idea of cheap and accessible Internet of Things things was right there for the taking. Then hackers figured out what was actually going on inside the ESP-8266. It was a full-blown microcontroller. There was Lua stuff you could put on it. You could program it with the Arduino IDE. It had WiFi. This was the greatest microcontroller release in the last decade, and it came from a company no one had ever heard of. Since then, the ESP ecosystem has bloomed, and there’s a new ESP on the block. The ESP-32 is an even more powerful WiFi and Bluetooth-enabled chip that’s just as easy to program, and it costs three dollars. 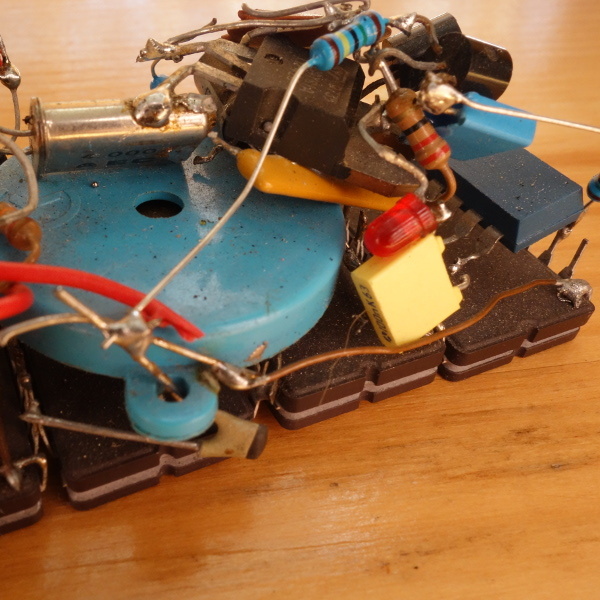 Microcontrollers have never been cooler. For this week’s Hack Chat, we’re going to be talking all about the ESP. Our guest for this Hack Chat should need no introduction, but if you’re unfamiliar, [Sprite_tm] plays video games on his keyboard and has installed Linux on a hard drive. He also works at Espressif, the company behind the ESP-8266 and ESP-32, where he’s applied his skills towards tiny Game Boys and miniature Macs. During this week’s Hack Chat, we’re going to be covering everything about the ESP, including peripherals, ultra-low power consumption, SIP packages, and what’s coming up for the ESP family. 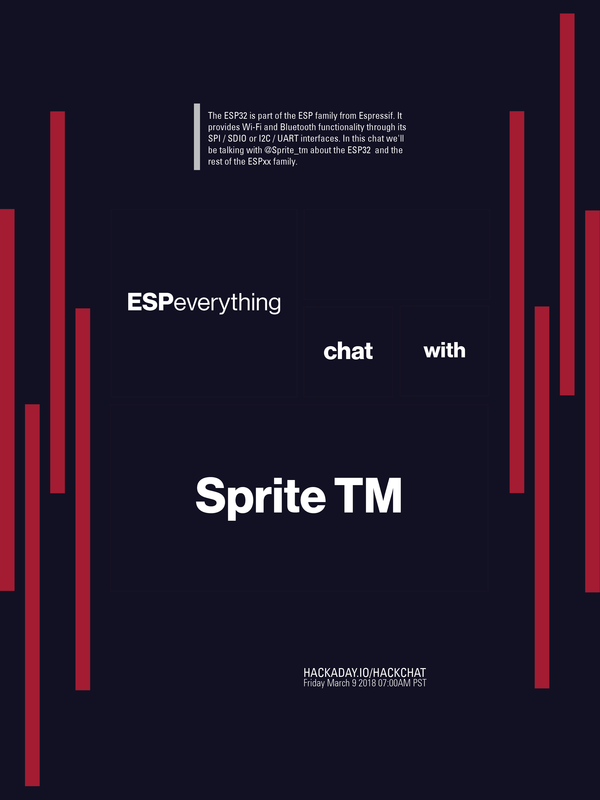 You are, as always, welcome to submit your questions for [Sprite]; just add those as a comment on the Hack Chat page. Our Hack Chats are live community events on the Hackaday.io Hack Chat group messaging. [Sprite]’s in China, so we’re not doing this one at the usual time: This week, the Hack Chat will happen at 7:00 am, Pacific, Friday, March 9th. Want to know what time this is happening in your neck of the woods? Have a countdown timer! The nearly limitless array of consumer gadgets hackers have shoved the Raspberry Pi into should really come as no surprise. The Pi is cheap, well documented, and in the case of the Pi Zero, incredibly compact. It’s like the thing is begging to get grafted into toys, game systems, or anything else that could use a penguin-flavored infusion. But this particular project takes it to the next level. Rather than just cramming the Pi and a cheap LCD into his Numworks graphing calculator, [Zardam] integrated it into the device so well that you’d swear it was a feature from the factory. 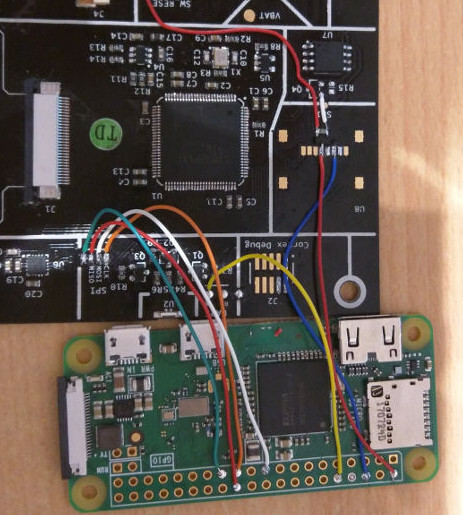 By exploiting the fact that the calculator has some convenient solder pads connected to its SPI bus, he was able to create an application which switches the display between the Pi and the calculator at will. With just a press of a button, he’s able to switch between using the stock calculator software and having full access to the internal Pi Zero. In a very detailed write-up on his site, [Zardam] explains the process of getting the Pi Zero to output video over SPI. The first part of the battle was re-configuring the GPIO pins and DMA controller. After that, there was the small issue of writing a Linux SPI framebuffer driver. Luckily he was able to find some work done previously by [Sprite_TM] which helped him get on the right track. His final driver is able to push 320×240 video at 50 FPS via GPIO, more than enough to kick back with some DOOM. With video sorted out, he still needed a way to interface the calculator’s keyboard with the Pi. For this, he added a function in his calculator application that echoed the keys pressed to the calculator’s UART port. This is connected to the Pi, where a daemon is listening for key presses. The daemon then generates the appropriate keycodes for the kernel via uinput. [Zardam] acknowledges this part of the system could do with some refinement, but judging by the video after the break, it works well enough for a first version. We’ve seen the Pi Zero get transplanted into everything from a 56K modem to the venerated Game Boy, and figured nothing would surprise us at this point. But we’ve got to say, this is one of the cleanest and most practical builds we’ve seen yet. The PocketSprite is the tiniest fully-functional Game Boy Color and Sega Master System emulator. Not only is it small enough to fit in your pocket, it’s small enough to lose in your pocket. It’s now available as a Crowd Supply campaign, and it’s everything you could ever want in a portable, WiFi-enabled, fully hackable video game console. It also plays Witcher 3. And probably Crysis, because of the meme. This has been a year and a half in the making. The first hardware version of the PocketSprite was revealed at the 2016 Hackaday Superconference by hardware engineer extraordinaire [Sprite_TM]. As [Sprite] has a long list of incredibly impressive hardware hacks like installing Linux on a hard drive and building a Matrix of Tamagotchis, he always has to keep pushing deep into the hardware frontier. In 2016, [Sprite] showed off the tiniest Game Boy ever, powered by the then brand-spankin’ new ESP32. This was released as Open Source, with the hope that a factory in China would take the files and start pumping out mini Game Boys for everyone to enjoy. Now, a year and a half later, it’s finally happened. In a collaboration with manufacturing wizard [Steve K], [Sprite] is the mastermind behind TeamPocket. The pocket-sized Game Boy-shaped emulator is now real. This is our hands-on review. SpriteTM, or [Jeroen Domburg], has a bit of a following around these parts. He’s installed Linux on a hard drive the hard way. He can play Snake on his keyboard. He’s cared for several generations of Tamagotchis. In short, there are very few people who have both the technical ability and sense of humor to pull off what [Sprite] does. At last year’s Supercon, we pulled Sprite aside to talk about his work and his latest hack, the tiniest Game Boy ever. He talked about his Supercon keynote, and how to hack the crypto challenge in last year’s Superconference badge in an hour without solving any of the puzzles. Now, we’re happy to present that interview today, available below. While we very much doubt many people could — or would — take four conference badges and rick roll the entire Superconference for the badge hacking session, we’re still looking for eager and capable presenters. The Call for Proposals is now open for the 2017 Hackaday Superconference. If you have a story of hardware heroics, creativity in CPLDs, a passion for prototyping, or an ambition for technological art, we want you to share your story. Even if you don’t, that’s fine, too: tickets are still available for the Superconference in Pasadena, California on November 11th and 12th.